We use the finest recycled plastics to make the lakeside hideaway settee. The plastic is made from 96% recycled milk jugs the other 4% is uv stabilized colors. Available in earth tone, tropicals, black, white and grey. Also the colors can be two toned. 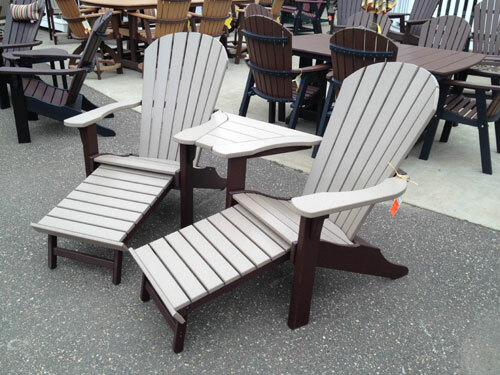 All the Adirondack chairs that we make sits 2″ higher in the front legs, so you can get in and out easier. What makes this piece unique is the pull out and hideaway ottomans. American made with a twenty year warranty.